Question: Is an iPhone version of a TV game show well past its prime—where a single wrong answer ends your game, and the greatest victory possible is winning a ton of fake money—worth a $5 App Store purchase? A: Yes, in spite of the creepy digitized Meredith Viera that launches each game. B: Probably, as long as you don’t mind the constant tapping required to make the game go faster (instead of sitting through scoreboard animations, answer animations, lingering “Correct!” screens, and the like). C:Sure, if you like trivia games with the added bonus of a few adequately-implemented lifelines. The correct answer, of course, is D: It would be, if not for a showstopper bug. But we’ll get to that in a minute. Save Me, Regis: Who Wants to Be a Millionaire for the iPhone offers all the trappings of the TV show including multiple choices and lifelines. Integration with your address book with the “Phone-a-Friend” lifeline is cute. But the game always picks the same three friends for me (one of whom is… me). Unfortunately, though, in my testing, the game crashes my iPhone every single time if I allow the screen to lock while playing. When I wake the device up again, the iPhone reboots. If the developers can squash that nasty bug, Millionaire would be a solid recommendation for trivia buffs. Capcom also offers a free version that caps off your willings at the $2,000 question, if you want to try the game before parting with a $5 slice of your millions. 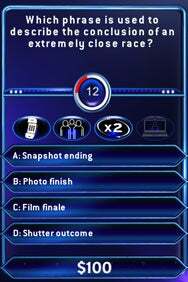 Who Wants to Be A Millionaire is compatible with any iPhone or iPod touch running the iPhone 2.2 software update.